The Arafura Games are over for another year. Congratulations to the Sports Authority of Thailand who won gold in both the regu and doubles events! Congratulations also go to the Terengganu State teams from Malaysia who took out silver in both regu and doubles, and China who came in close behind with bronze medals in both competitions. Thank you to everyone who attended this year to compete or cheer, and a special thanks goes to the volunteers and local organisers for making it all happen, and the international referees for keeping us on track. 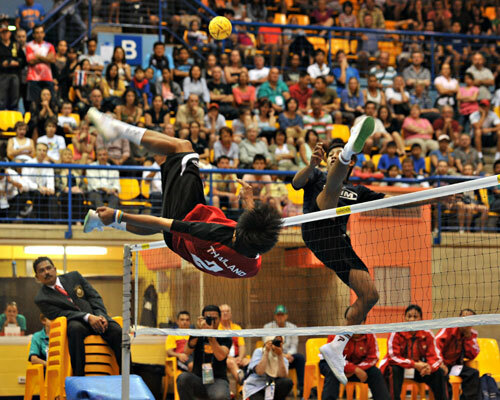 We’re intending to make the 2013 Arafura Games sepak takraw competition the biggest yet with 16 mens teams and hopefully, for the first time, a womens competition consisting of at least 8 teams. Hope to see you- the same smiling faces – and many more, in two years time!